One of the few things I remember about meeting Rhett Miller, was my inability to stop giggling. I was at the Summer Break Records showcase at SXSW a few years ago when Robert Jenkins (president of Summer Break) asked me if I’d like to meet Rhett. Let’s face it, the man is flat-out dreamy. The other thing that I remember was how very warm, welcoming and charming he was on that day, which was surprising considering that he was dealing with a middle-aged mother of two who was giggling like a little school girl. Another part of my admiration for Rhett Miller stems from his loyalty to the local and regional music community. This fact proves, once again, that we have some of the finest musicians, producers and songwriters in the country living and working right here in North Texas. Otherwise, why would the frontman for the Old 97’s, who resides in New York with his family, come all the way back to Texas to make records? Salim Nourallah produces his records. John Dufilho often performs on his albums. Jason Janik is his local photographer of choice (Jason shot the cover of Rhett’s latest self-titled solo album). Rhett Miller performs with Salim Nourallah, The O’s and Shibboleth at a benefit concert at the Granada Theater on Saturday night. This show will benefit Breathe Easy, an organization dedicated to raising money for Cystic Fibrosis research. Art&Seek has four pair of tickets to give away for Saturday night’s concert. Email [email protected] with the answer to the question – where did Rhett attend high school – and the first four correct emails will win! Art&Seek: This is the third year in a row that you’ve agreed to perform for the CF Concert Series. Do you have a personal reason for supporting this event, the organization and the fight against Cystic Fibrosis. Rhett Miller: My brother Ross Miller is one of the event’s organizers. He’s a smart dude with a big heart. So I agreed to get involved. Since then I’ve been amazed by how many lives are affected by CF. And so many of the people living with Cystic Fibrosis are so young. But they are living longer all the time thanks to the research that’s being done. Less than 50 years ago, kids born with CF, often didn’t make it to kindergarten. As the father of a 5 year old, my heart breaks to hear that. Now it is possible, even likely, for them to live well into adulthood. Research is showing real promise. Thank goodness there is something we can do. A&S: I’ve heard that you have fans flying in from all over the country to attend this show. Tell me about your relationship with your fans. R.M. : My fans are intelligent, well-mannered, and tidily-groomed. I appreciate the opportunity to interact with them. Twitter is good for that, though Facebook is too much for me. In person is the best. I always appreciate having a stranger tell me that I’m awesome. It counteracts the voices in my head. A&S: The past two years you’ve lined-up a roster of local (Dallas-Fort Worth) bands to open for you at this event. Is it sort of an old home night of friends and music, as well as a worthy cause benefit? R.M. : That’s a good way to put it, “friends and music.” Gordon Keith returns to emcee the event and he and I might just pull something out of our hats. I’m thinking there might be a few fun surprises this year. A&S: Will your set-list be filled with more of your popular well-known songs on Saturday night, or will we hear some stuff you are recording for the upcoming Old 97’s album in January? R.M. : I’m currently taking requests via Twitter. I anticipate playing a bunch of 97’s and solo stuff. Got to keep the people happy. And, yeah, I’ve been writing like crazy, so I might try out a new song. A&S: Although you live in New York, you continue to associate yourself, professionally and musically with, not only some of the best Dallas and Austin-based musicians and producers, but also some of the nicest, most genuine people I know. Tell me a little about that. R.M. : I love Dallas and have family and friends all over town. I love to come home and visit. It also just so happens that the greatest, most under-rated producer in the country, Salim Nourallah, lives in Lower Greenville. Not to mention some of the best musicians I’ve ever come across in the world… Dallas rules. A&S: Some of these folks include Salim Nourallah, John Dufilho and Billy Harvey, all of whom performed (and/or produced) on your latest self titled album. Tell me about the mood in the studio when you are all working together. R.M. : The mood was fun and experimental. But we worked quickly. It was all about music. I like to be productive at work and goof off elsewhere. Plus watching all those guys come up with these brilliant parts is awe-inspiring. I like to get quiet and listen. A&S: You recorded this album with Salim Nourallah at his Pleasantry Lane Studio. Your son Max and Salim’s son Gavin are pretty tight. Do you have any good stories about those two during your time recording at Pleasantry Lane? R.M. : Oh, they made up some pretty silly songs. But we’re keeping those under wraps until their record comes out. 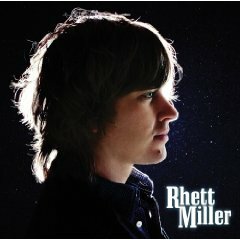 You can check out more Rhett Miller on KXT 91.7. Tune in to the Morning Show with Gini Mascorro on November 17, to hear an interview and performance audio from the Granada Theater.